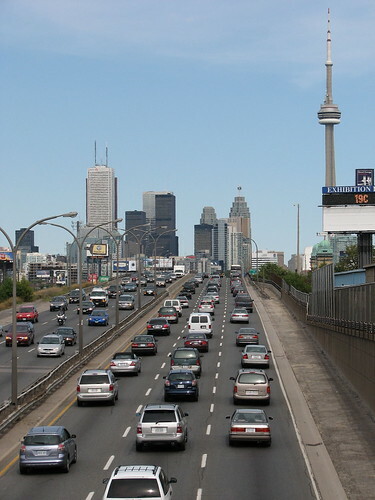 Toronto has been talking road tolls for some time now (link). So, I’m listening to talk radio as usual, and once more the subject of road tolls going in and out of Toronto is on the agenda. Someone in Toronto is taking umbrage once again at the idea that people from outside the GTA are daring to use the roads that Toronto has paid for. As my pal Chris and I talked about Toronto’s passive/aggressive, superiority/inferiority complex, and the impact of such a decision, it occurred to me that had such road tolls been in place in other cities over the past year it would have had an immediate impact on my own life. As those who follow this blog know, last year I was diagnosed with cancer and since there are no cancer clinics here in Guelph I had to travel to other places to receive treatment; places like Hamilton’s Juravinski Cancer Centre on the mountain, and St. Joseph’s Hospital downtown. All told, over the last 18 months, I have made 43 trips to Hamilton for diagnosis, evaluation, surgery, radiation treatments and follow-up, with another in fact scheduled for tomorrow. The average toll on the 407 is in the $8-$10 range, so if we use that as a base, each way, then I would have been looking at between $680 and $860 dollars an additional cost to receive my treatments had there been such tolls in place at the time. Not a great deal I’ll admit, but when you add in parking, fuel, insurance (one volunteer driver told me his insurance company increased his rates when they found out what he was doing) it adds up. Especially if you are on a limited income. Like many of the volunteer drivers who took me to my appointments are. Even if I owned a car, the nature of the majority of my treatments were such that I was told not to drive on the days of my appointments. And while many of my friends offered to drive me down and back again, scheduling conflicts resulted in about 2/3 of the trips being made with the help of the Canadian Cancer Society. Cancer Society volunteers drive patients to doctor appointments and treatment sessions all over the country. Most of them are retired folks looking to do some good with their free time. As a result most of them are also on a fixed income. Even with the small mileage stipend provided by the Society (at the time of my radiation visits it was $0.20/km) most of these drivers end up spending a good chunk of change providing this service. Many that used to volunteer are ceasing to do so due to the expense. Adding road tolls on top of fuel, etc. is not going to help stem the decline. Hundreds of people every day travel to major cities like Toronto, Hamilton, and London not because we have chosen to live or work there but because some medical facilities are available nowhere else. Every time the cost of traveling to one of these cities goes up, the cost for some people, of staying healthy, or even alive, goes up with it. Now, would road tolls have kept me from going for my treatments? Of course not! But they would have kept me from going for coffee or even lunch while I was there as my lunch money would have had to go to pay the toll. And what city can afford that in this economy? And it likely would have forced me to seek out alternate, and likely far more expensive, means of transportation as there would have been a lot fewer volunteers. It is expenses such as these that contribute to the health care burden on the average citizen. These are among the ‘hidden’ health care costs that rarely get calculated into the formulas. Politicians and bureaucrats need to remember that road tolls and other revenue raising methods can affect more than just the bottom line.